Just watched the final 20 kms of today's stage (+ some fast forward over the preceding 100 km or so). What a day for the break! They were obviously in good shape, all of them, but also technically and tactically riding very well, disciplined until the 1 km mark. The WT teams just couldn't catch them, despite trying hard, at least Sky and Dimension Data. Astana will not be popular with the others, for never trying to help. Some ride by Tanfield. There was something of the Cancellara in the way he finished that. I didn't realize Tanfield is very local! Today, i think we are up for a more race more à l'ardennoise as they probably like to say in Yorkshire, where they have all these French names? That last litte côte there, côte de cow and calf, is that a Fleche-wall one? I guess we can trust the WT teams to keep it all pretty tight together today, after yesterday's blunder. The race up the hill could be decisive for the GC. Jokes aside, I live in Yorkshire at the moment and have a lot family history from here. So, this this is pretty much my local race, but boy does the cringeworthy Franglais make it hard to love... "Cote de Hebdon Bridge" get the **** outta here. 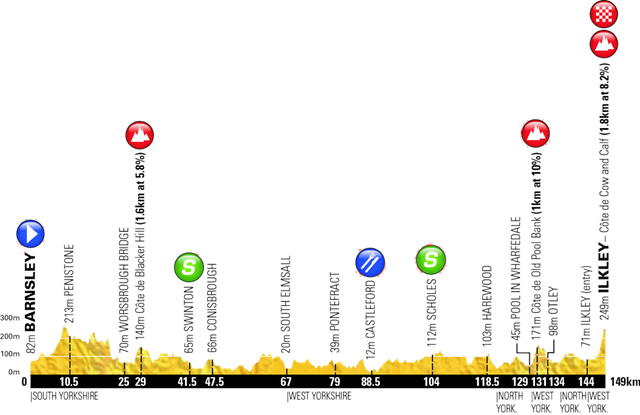 I do like the little | WEST YORKSHIRE | NORTH YORKSHIRE | WEST YORKSHIRE | on the stage profiles like it's an Alpine TdF stage passing Mont Blanc on its way into Italy though. Cor, what a finish. A real nail biter, whereas the Giro stage was more of a nail filer. Poor old Chava: so close. Gotta love the French teams in ASO Yorkshire territory. They really come to race. You know that I do agree with you on that but you'd sure realise that the French language is now invaded with English borrowings and the Dutch language as well. I'm not necessarily referring to cycling-related issues here, just the overall language. I'm working in the food business and it's staggering how many restaurant owners name their meals in English, especially in Flanders. But even with regards to cycling, I've referred to the English feed graphics on Sporza and Rai international, Belgian riders being interviewed in English on Belgian TV, or else foreign riders like Juan-Antonio Flecha being interviewed in English instead of French while Flecha is married with a French woman and lives in Toulouse. I now often see French forum posters on velo-club.net referring to "ITT" instead of "CLM" (Contre-la-montre), etc. The name "Tour de Yorkshire" is even more ridiculous as it is ungrammatical French. It should write "Tour du Yorkshire", for "Yorkshire" is in the masculine gender. It was a cute little joke to have such deliberately clashing linguistics when the area was part of the Tour de France, and local shops and restaurants joined in the joke. Now it is just an embarrassing concession to those who can't conceive of cycle racing as anything other than the Tour de France. ASO don't try to impose it upon the Arctic Tour, or the Tour of Germany, so I guess it must be Gary Verity's sense of humour. I have no doubt that your French is much better than mine, but that reckoning, would the July race not be called "Tour de la France"? A worthy winner, beautiful weather and terrain, big crowds, but not that exciting (I thought anyway). yeah, BMC was a bit too strong to really make it exciting today. But still quite a good race. After all the stick I have given this event over the years. I really enjoyed it and thought it was really exciting racing on a decent course.